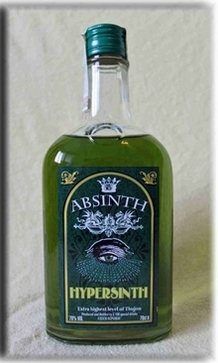 Location: Home » ABSINTHE » SWISS ABSINTHE » KÜBLER L`EXTRAIT D`A..
1,0 l - 53% vol. alc. Kübler L`Extrait d`Absinthe is one of the very best varieties available from Switzerland. The Kübler family production of absinthe is a great tradition, recalling the roots of absinthe history in the Swiss Val de Travers district of 1863. Following the Swiss prohibition in 1910, they managed to find a small hole in the in the legislation which allowed them to continue production. To this day, they are the only company allowed to produce Extrait d’Absinthe. The product is a brilliant crystal-clear “La Bleue” absinthe. It has a milk-white louche and a truly excellent taste! This absinthe’s availability has been long-awaited by enthusiasts from all over the globe. Here available in the 1,0 l bottle with 53% vol. alc.